1. Click the "Arrow" adjacent to Data Exchange. 2. Click the "Arrow" adjacent to Medicaid Request. 1. Select the appropriate ISD from the Drop Down. 2. 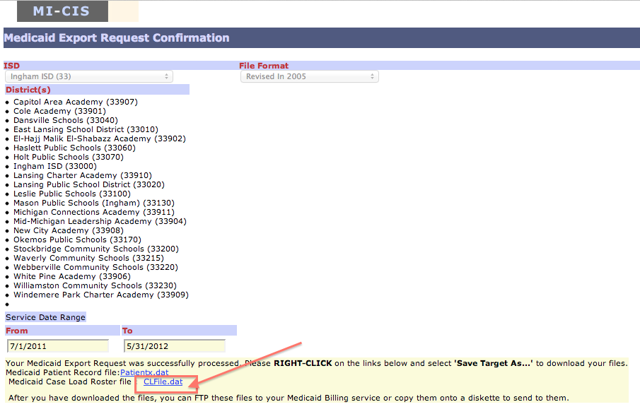 Select "Revised in 2005" from the Drop Down. 3. Select the appropriate districts from the Drop Down menu (you may choose to create the Client File for All Districts). 4. Input the "From" date by entering the date into the text box or by using the Date Picker Icon (it is recommended to use 7/1/2011 as a "From" date). 5. Input the "To" date by entering the date into the text box or by using the Date Picker Icon (the "To" date should be the date the report is being generated). Right click on the link "CLFile.dat" and Save As to a location on your hard drive. You have successfully generated the CLFile from MICIS for Illuminate. Very Important Note: Modifications to the Client File are necessary. THE CLIENT FILE CANNOT BE IMPORTED TO ILLUMINATE AS IS! From here, the client file must be reformatted from .dat to .txt to match the layout from the Illuminate Supplemental Data Specifications. Three fields that are not in the Client File in its original form must also be added. Those fields are Provider PIC, Placement Hours, and LRE. 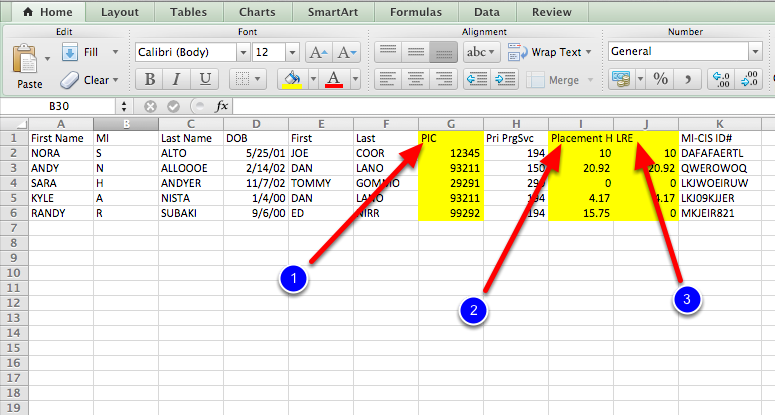 The above screen shot represents a sample of what the data should look like once it has been extracted and manipulated to match the Illuminate Supplemental Data Specifications. Hint: The three digit program or service code in the Client File for each student/provider relationship is typically found attached to the MICIS ID as the first three digits. For example, the combined program/service code and MICIS ID may look like "194DE3029K." 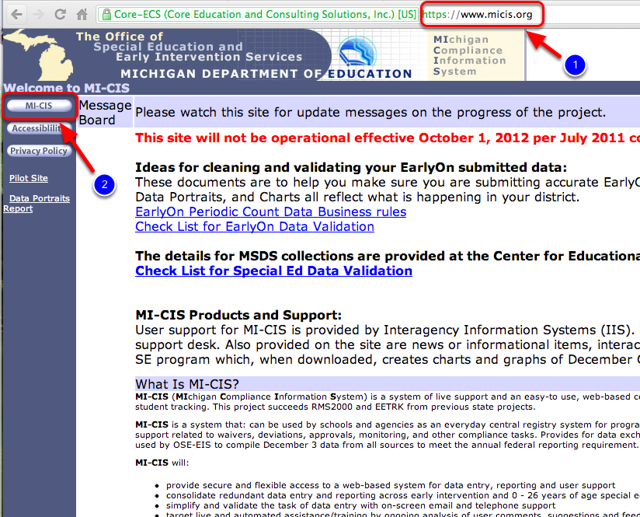 In this case "194" is the program/service code and "DE3029K" is the MICIS ID. This is consistent throughout the Client File. 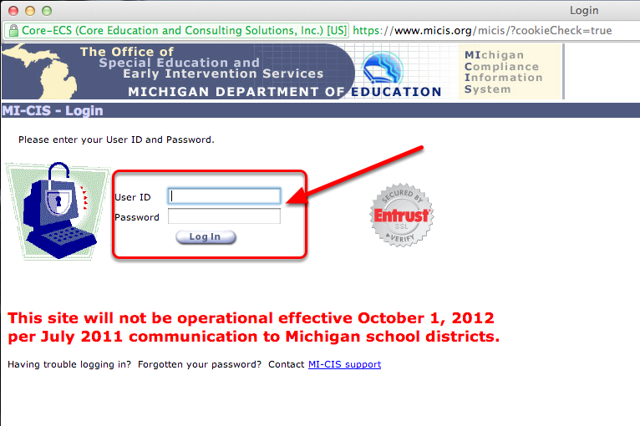 Also, some manipulation of the student's birth date (DOB) field will be required. 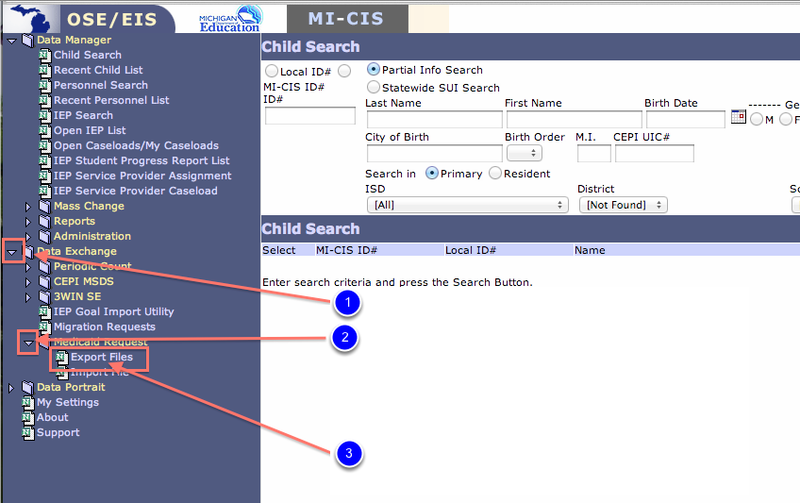 MICIS provides the birthdate in the following format e.g., "19991219." This will need to be modified to match the following format "12/19/1999." 1. Employee PIC Numbers: PIC numbers can be found in the District's REP file and should be populated for all entries in the client file. Entries without a PIC or entries with a PIC number that does not match a user in Illuminate WILL BE REJECTED. 2. Placement Hours: The Placement Hours should be the number of hours that the student is in each respective placement per week. For example if a student is in a Resource Room program for five hours per week, the placement hours is 5. If a student is in Speech Therapy for 15 minutes per week, the Placement Hours is .25. 3. Least Restrictive Environment (LRE) Hours: The LRE Hours for a student are the number of hours the student receives the program or service away from his/her non-disabled (general education) peers per week. For example, if a student receives Resource Room for five hours per week in a special education classroom, the LRE for that student is 5. Similarly, if a student receives speech therapy for 30 minutes per week in a therapy room with other special education students (no gen ed peers) the LRE for that student would be .5. Cases of inclusion are handled slighlty different. For example, if a student receives a Resource Room program for five hours per week but the special education teacher comes into the general education classroom and coteaches, the student's LRE is 0. Similarly, if a student receives speech therapy for 30 minutes each week but the therapist comes in to the general education classroom and provides the therapy, the LRE is 0. These examples are limited, as there are many combinations of inclusion and pullout services that could be provided both within a single program or across programs/services. Further, the LRE Hours cannot be found in MICIS and are required as part of the Client File. The reason that Illuminate requires this data is because Illuminate has the capability of automatically calculating primary educational setting (Instructional Setting) for those students with a setting translating to code 11, 12, or 13. Previously, in MI-CIS, adminsitrative assistants had to manually flag these instructional settings. Because Illuminate is a smart system, we require providers to input this information when creating IEPs via the user interface as part of creating a program or service (i.e. providers input the number of hours that the student spends in the placement away from non-disabled peers). Because Illuminate knows both the number of hours students spend away from non-disabled peers for each program/service a student receives, as well as how many hours comprise a school week, the system can automatically calculate the student's Instructional Setting. For students with an Instructional Setting that falls outside the bounds of codes 11, 12, or 13, the setting must be manually indicated via Student Demographics in the user interface. From past experience, it is best to receive this information directly from the providers themselves. This can be done by either enlisting/training providers to do data detox within Illuminate via the user interface, or by asking them to provide the data via spreadsheet, compiling the data into the Client File, and then performing a data upload. While there are pros and cons to either method, it is important to make sure that the LRE hours are as accurate as possible to ensure accurate pupil accounting. Lastly, once you have successfully made the requisite modifications to the original Client File generated by MI-CIS (i.e. added PIC, Placement Hours, and LRE) you should upload it to the appropriate subfolder on the Illuminate Secure Site via SFTP Client. For additional help with the Client File, uploading to the Illuminate Secure Site, or if you have any other questions please contact your Implementation Manager or Data Support Specialist. You may reach us via e-mail at help@illuminateed.com, or by telephone at (517) 224-4499 between 8:00am and 5:00pm EDT.